The legend of the Shelby Mustang GT350-H Hertz race ready rental cars is an old campfire story among car guys, but a little known fact is that there were a few hundred Mercury Cougar XR7-G (G for Gurney...as in Dan Gurney) rental ready racers built alongside the Shelby Mustangs. This next example is a complete basket case with rust everywhere and a seized engine...but it looks like Dynacorn is getting into the Cougar resto-sheet metal business and for a few tens of thousands of bucks this could be a keeper. Find this 1968 Mercury Cougar XR7-G here on eBay bidding for $4,750 reserve-not-met located in Lake Elsinore, CA with 2 days to go. 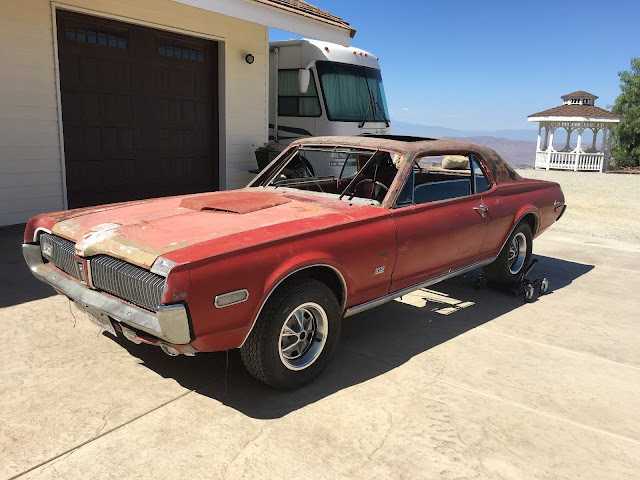 Time to sell my 1968 Mercury Cougar XR7-G Hertz Rent-A-Racer. The car is a complete project car but is mostly there. The important (expensive) G related parts are there. The center console, G-Mirror, hood scoop, and the fog lights are there. 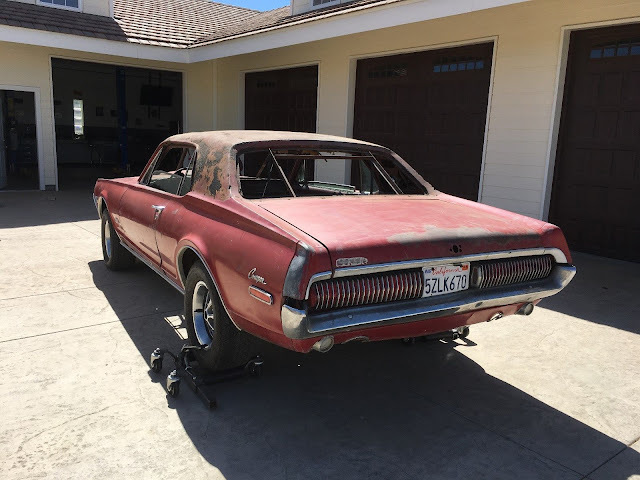 G specific parts that are missing are the trunk lock emblem, roof rail and headlight emblems, all 3 horns, shifter handle and the exhaust tips. From my deduction, many years ago the passenger side rocker arm was not oiling well and one of the valves stuck and the piston closest to the firewall mashed right into the stuck valve. The owners at the time took part of the engine apart until they found the valve indented into the piston. The car was the store outside and that’s when the deterioration started. I never received the passenger cylinder head and any of the parts from the front part of the engine like the radiator, AC condenser, fan shroud and the power steering pump. The engine oil pan was also not on the engine. The replacement cylinder that I installed ins not year correct but it does have the smog ports and is set up for the GT manifolds. The head is bare without valves. 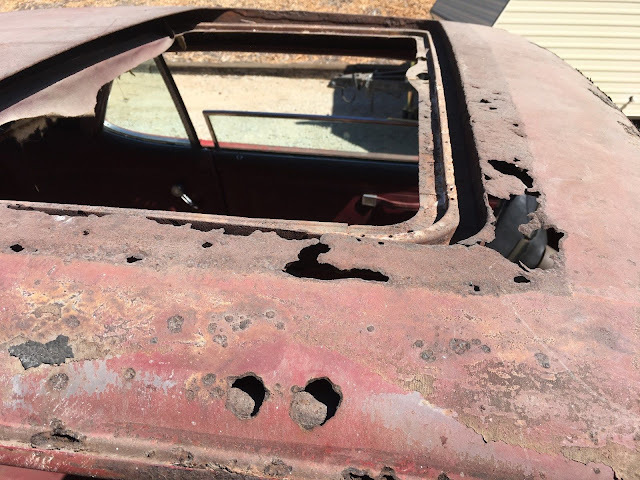 By sitting outside for many years, moisture worked its way under the vinyl top and started to rust out the roof. That worked its way into the cowl and the floor pans as well as into the trunk. I purchased the car and brought it to a body shop and had them start on the car. Passenger floor pan has been replaced as well as the rear seat pans, core support and radiator support. Body shop subsequently went out of business and the project was halted. If you are serious about this vehicle, please look at my videos. They will provide you with all of the information on the condition of the car and parts. You may need to highlight the link and copy & paste into your browser. Video #4 shows all of the original parts and any new replacement parts that come with the car. Video #5 is a video of the bottom of the car showing any work that needs to be done and all of the panels that have been replaced. What you see in the pictures and the videos is what you get. Please ask if you don’t see something in specific. I’ve tried to be forthcoming with the exact condition of this car. It’s a rare car in a desirable color. My reserve is reasonable. I'm selling this vehicle in "AS IS" condition with "NO WARRANTY" written or implied. I Require a $1,000 deposit within 24hours of auction completion via PayPal with the remaining balance via bank transfer, cash, cashier's or certified check within 72 hours of auction close. I can be flexible on pick-up of the car once the funds have cleared. Vehicle is currently located in Lake Elsinore, CA . If you can’t come through with the payment, please don’t bid on the car.